Background: Intensive statin therapy reduces major adverse cardiovascular events (MACE), but the effect on mortality is unclear. Objective: To determine whether intensive statin therapy reduces all-cause mortality compared with moderate statin therapy in patients with recent acute coronary syndromes (ACS) and stable coronary heart disease (CHD). Methods: Medline, Embase, the Cochrane Database, the internet, and conference proceedings from 1966 to 2006 were searched to identify relevant trials. Selection criteria were randomised allocation to intensive statin therapy (atorvastatin 80 mg/day, simvastatin 80 mg/day, or rosuvastatin 20–40 mg/day) versus moderate statin therapy, recent ACS or stable CHD at the time of randomisation, and ⩾6 months of follow-up. Results: Six trials, encompassing 110 271 patient-years, were pooled. In patients with recent ACS, intensive statin therapy reduced all-cause mortality from 4.6% to 3.5% over 2.0 years (OR = 0.75, 95% CI 0.61 to 0.93). In patients with stable CHD, intensive statin therapy had no effect on all-cause mortality over 4.7 years (OR = 0.99, 95% CI 0.89 to 1.11). Overall, intensive statin therapy was associated with a reduction in MACE (OR = 0.84, 95% CI 0.77 to 0.91) and admissions to hospital for heart failure (OR = 0.72, 95% CI 0.62 to 0.83). Intensive statin therapy was also associated with an increase in hepatic transaminases >3 times normal (OR = 3.73, 95% CI 2.11 to 6.58) and a trend towards increased creatine kinase >10 times normal and/or rhabdomyolysis (OR = 1.96, 95% CI 0.50 to 7.63). Conclusions: Compared with moderate statin therapy, intensive statin therapy reduces all-cause mortality in patients with recent ACS but not in patients with stable CHD. The benefits of statin therapy have been shown to be proportional to the achieved low density lipoprotein cholesterol (LDL-C) in patients with coronary heart disease (CHD).1,2 Intensive statin therapy aims at maximally reducing LDL-C and therefore further reducing major adverse cardiovascular events (MACE). The benefits of intensive statin therapy may be amplified by a dose-dependent activation of pleiotropic properties such as anti-inflammatory effects.3–5 The MIRACL Study was the first large scale trial of intensive statin therapy.6 In this trial, atorvastatin 80 mg/day reduced MACE by 16% compared with placebo in patients with recent acute coronary syndromes (ACS). More recent trials and a meta-analysis have shown that intensive statin therapy reduces MACE compared with moderate statin therapy, but these studies have been unable to demonstrate that this treatment reduces mortality.7 We sought to determine the effect of intensive statin therapy on all-cause mortality compared with moderate statin therapy in patients with recent ACS and in patients with stable CHD. Secondarily, we examined the effects of intensive statin therapy on MACE, admissions to hospital for heart failure, and adverse hepatic and muscular events. We searched Medline from 1966 to March 2006 using the following search terms: “hydroxymethylglutaryl-CoA reductase inhibitors”, “anticholesteremic agents”, “atorvastatin”, “cerivastatin”, “fluvastatin”, “lovastatin”, “pravastatin”, “rosuvastatin”, “simvastatin”, “randomized”, “randomized controlled trials”, “clinical trials”. We searched Embase from 1980 to March 2006, the Cochrane Central Register of Controlled Trials and Database of Abstracts of Reviews of Effects from inception to first quarter 2006, and the ACP Journal Club from 1991 to January/February 2006. We also searched the internet (http://www.clinicaltrials.gov,http://www.clinicaltrialresults.org,http://www.cardiosource.com,http://www.medscape.com,http://www.theheart.org,http://www.lipidsonline.org, all accessed 8 February 2007) and abstracts from major cardiology conferences in North America and Europe. We used relevant references from retrieved publications and PubMed’s related articles feature and also contacted investigators to identify studies not captured by our primary search strategy. We limited our search to human studies in any language. 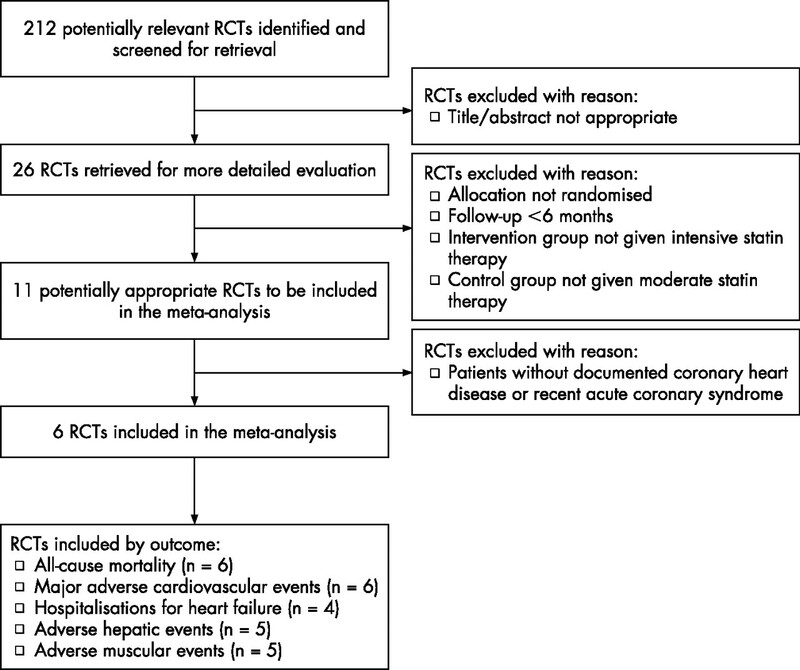 The inclusion criteria for our meta-analysis were: (a) randomised controlled trials (RCTs); (b) ⩾6 months of follow-up; (c) documented recent ACS or stable CHD at the time of randomisation; (d) intervention group given intensive statin therapy, defined as simvastatin 80 mg/day, atorvastatin 80 mg/day, or rosuvastatin 20–40 mg/day; (e) control group given moderate statin therapy, defined as pravastatin ⩽40 mg/day, lovastatin ⩽40 mg/day, fluvastatin ⩽40 mg/day, simvastatin ⩽20 mg/day, atorvastatin ⩽10 mg/day, rosuvastatin ⩽5 mg/day; these definitions were derived from the National Cholesterol Education Program Adult Treatment Panel III Guidelines’ table of currently available statins required to reduce LDL-C by 30–40% (“standard doses”).9 Three reviewers (JA, AAM, MJE) applied inclusion and exclusion criteria. All qualifying studies were assessed for blinding, concealment of randomised assignment, completeness of follow-up, and intention to treat analysis. We recorded whether patients in the intervention group and control group were similar at the start of the study and treated equally except for the designated treatment. Table 1 presents the validity parameters. All data were extracted in duplicate by two investigators (JA, AAM) using a standardised protocol and were independently verified by a third investigator (MJE). Disagreements were resolved by consensus. We collected information on the study name, first author’s name, year of publication, number of patients, duration of follow-up, inclusion and exclusion criteria, mean age of patients, gender distribution of patients, cardiac risk factors, prior myocardial infarction, cardiac drugs, intervention drug and dosage, control drug and dosage, LDL-C, total cholesterol (Total-C), high density lipoprotein cholesterol (HDL-C), triglycerides (TG) and C reactive protein (CRP). The efficacy outcomes abstracted were: all-cause mortality, CHD mortality, non-CHD mortality, admissions to hospital for heart failure, MACE defined as cardiovascular death or ACS (troponin positive or troponin negative) or stroke. Given the variability in defining MACE between trials, we accepted that the definition for MACE may have included need for revascularisation or resuscitated cardiac arrest because these events contributed a relatively minor proportion of the MACE end point. The safety outcomes abstracted were: adverse hepatic events, defined as an increase in alanine aminotransferase and/or aspartate aminotransferase >3 times the upper limit of normal according to the measuring laboratory standards; adverse muscular events, defined as clinically diagnosed rhabdomyolysis and/or an increase in creatine kinase >10 times the upper limit of normal according to the measuring laboratory standards. We extracted overall study data and not individual patient data. Safety and efficacy outcomes were analysed for the prespecified subpopulations of patients with recent ACS and patients with stable CHD. The numbers of events for every outcome in every trial were pooled and entered into the statistical software (Cochrane Collaboration Review Manager 4.2.7). Differences in study characteristics introduced an additional source of heterogeneity in the estimated treatment effects between trials. These differences would not be adequately dealt with in a fixed-effects model. We therefore employed a random-effects model to better account for the differences between trials. Heterogeneity was assessed using the I2 test. An I2 value <25% was considered low heterogeneity, and a value >50% was considered significant heterogeneity. Results were reported as odds ratios (ORs) with their 95% confidence intervals (CIs). Figure 1 shows the QUOROM flow diagram. Our search returned 212 distinct results, of which 26 were relevant based on their title and abstract. Six RCTs met the selection criteria and were included in our meta-analysis. Of these RCTs, all six reported rates of all-cause mortality and MACE, four reported rates of admission to hospital for heart failure, five reported rates of adverse hepatic events and muscular events. Table 1 shows the study characteristics. Two RCTs studied patients with recent ACS (A to Z,10 PROVE-IT TIMI 2211) and four RCTs studied patients with stable CHD (IDEAL,12 TNT,13 VASCULAR BASIS,14 REVERSAL15). When pooled, the total number of patients was 28 505, representing 110 271 patient-years of follow-up. The mean weighted follow-up period was 2.0 years in trials of recent ACS and 4.7 years in trials of stable CHD. Table 1 shows completeness of follow-up, blinding and the analytic approach. All RCTs were published between 2004 and 2005. The mean age was 56–64 years and the proportion of women was 14–28%. Table 1 also shows rates of prior myocardial infarction and diabetes mellitus. Use of aspirin and β blockers was similar between trials, whereas use of angiotensin converting enzyme inhibitors or angiotensin receptor blockers ranged from 24% in VASCULAR BASIS to 84% in PROVE-IT TIMI 22. Previous use of statins ranged from 0% in A to Z to 76% in IDEAL (not including TNT where there was a 1 month run-in period during which all patients received atorvastatin 10 mg/day). Table 2 shows the intensive and moderate statin therapy regimens and the achieved lipid and CRP levels. Figures 2–6 show the forest plots with odds ratios for each study and for the pooled data. In patients with recent ACS, intensive statin therapy reduced all-cause mortality from 4.6% to 3.5% (OR = 0.75, 95% CI 0.61 to 0.93). The number needed to treat to prevent one death was 90. In patients with stable CHD, intensive statin therapy did not reduce all-cause mortality (OR = 0.99, 95% CI 0.89 to 1.11). MACE were comparably reduced in patients with recent ACS (OR = 0.86, 95% CI 0.73 to 1.01) and stable CHD (OR = 0.82, 95% CI 0.75 to 0.91). The odds ratios for MACE in patients with recent ACS demonstrated significant heterogeneity (I2 = 63%). Admissions to hospital for heart failure were reduced in patients with recent ACS (OR = 0.63, 95% CI 0.46 to 0.86) and stable CHD (OR = 0.77, 95% CI 0.64 to 0.92). Overall, the numbers needed to treat to prevent one MACE and one admission to hospital for heart failure were 46 and 112, respectively. Forest plot for all-cause mortality. Forest plot for major adverse cardiovascular events. Forest plot for admissions to hospital for heart failure. Forest plot for adverse hepatic events. Forest plot for adverse muscular events. For the safety analyses, patients with recent ACS and stable CHD were pooled owing to low event rates in the individual RCTs. Intensive statin therapy was associated with a threefold increase in adverse hepatic events from 0.4% to 1.4% (OR = 3.73, 95% CI 2.11 to 6.58) and a trend towards increased adverse muscular events from 0.05% to 0.11% (OR = 1.96, 95% CI 0.50 to 7.63). As a result, the number needed to harm to cause one adverse hepatic event was 96. The odds ratios for adverse hepatic events demonstrated significant heterogeneity (I2 = 63%). We were not able to pool non-serious adverse muscular events (myopathy without significant rise in creatine kinase) because these results were reported inconsistently and defined differently across RCTs. TNT showed that intensive statin therapy did not increase non-serious myalgias (4.8% vs 4.7%, p = 0.77). We analysed cause-specific mortality to quantify the effect on CHD mortality and to clarify whether there was an effect on non-CHD mortality. Similar to the initial findings, intensive statin therapy reduced CHD mortality in patients with recent ACS (OR = 0.75, 95% CI 0.58 to 0.97) but not in patients with stable CHD (OR = 0.90, 95% CI 0.73 to 1.11). There were no effects on non-CHD mortality among patients with recent ACS (OR = 0.78, 95% CI 0.53 to 1.15), patients with stable CHD (OR = 1.07, 95% CI 0.88 to 1.30), or patients with either recent ACS or stable CHD (OR = 1.00, 95% CI 0.82 to 1.23). To ensure that the smaller studies had not disproportionately influenced our results, we pooled data from TNT and IDEAL and analysed these trials using a fixed-effects model. The effect of intensive statin therapy on all-cause mortality in large trials of stable CHD was non-significant and identical to the initial findings (OR = 0.99, 95% CI 0.89 to 1.11). We sought to compare the effect of intensive versus moderate statin therapy on all-cause mortality in patients with recent ACS and stable CHD. Our meta-analysis is, as far as we know, the first to show that intensive statin therapy reduces all-cause mortality after recent ACS with no apparent reduction in stable CHD. MACE and admissions to hospital for heart failure were reduced in both these groups. Adverse hepatic events were increased threefold but were relatively infrequent. These findings suggest that intensive statin therapy should be the standard of care in patients with recent ACS. The clinical benefits of intensive statin therapy have been clearly shown in these trials; the mechanisms underlying these clinical benefits represent a field of continuing study and validation. Potential mechanisms are threefold: dose-dependent pleiotropic effects, incremental LDL-C lowering effects, and regression of atherosclerosis. The first of these may be of particular relevance in the setting of ACS where there is a state of acute inflammation and thrombogenicity. By exploiting dose-dependent pleiotropic properties, intensive statin therapy exerts potent anti-inflammatory effects and decreases thrombogenicity. A detailed review of these effects can be found elsewhere.4 Interestingly, these effects occur acutely and are independent of LDL-C.16 Statins decreased thrombogenicity by increasing tissue plasminogen activator levels and decreasing plasminogen activator inhibitor-1 levels in ex vivo models where there was no LDL-C present.17 Compared with simvastatin 10 mg/day, ezetimibe 10 mg/day (a cholesterol absorption inhibitor) reduced LDL-C by an identical 15% without improving endothelial function.18 These studies provide a physiological rationale for the heightened benefits seen after recent ACS, which cannot be attributed solely to the slightly higher event rates in ACS compared with stable disease. There exists a log-linear relationship between achieved LDL-C and MACE as shown by the Cholesterol Treatment Trialists’ meta-analysis of 14 RCTs.1 PROVE-IT TIMI 22 showed that an achieved LDL-C <1.0 mmol/l (<40 mg/dl), observed in 11% of patients in the intensive group, was associated with the lowest risk of MACE and no increase in adverse events.31 Indirect evidence from observational studies of hunter-gatherer populations showed that LDL-C of 1.3–1.9 mmol/l (50–75 mg/dl) was associated with improved longevity and an absence of atherosclerosis up to the seventh and eight decades of life.32,33 Studies of patients with heterozygous hypobetalipoproteinaemia showed that LDL-C as low as 0.8 mmol/l (30 mg/dl) was associated with improved longevity.34,35 In our meta-analysis, achieving a mean LDL-C of 1.6–2.1 mmol/l (62–81 mg/dl) was safe and effective for reducing MACE. Beyond the anti-inflammatory and lipid-lowering effects, intensive statin therapy slows and perhaps reverses the progression of atherosclerosis. In REVERSAL, serial intravascular ultrasound examinations showed that atheroma volume stabilised in patients receiving atorvastatin 80 mg/day, whereas it increased in patients receiving pravastatin 40 mg/day. ESTABLISH36 and ASTEROID37 showed that atheroma volume actually regressed in patients receiving intensive statin therapy. Similarly, ARBITER38 and ASAP39 showed that carotid intima media thickness regressed in patients receiving atorvastatin 80 mg/day, whereas it increased in patients receiving moderate statin therapy. Emerging research has shown that the effects of statins on quantitative atheroma volume may be less valuable than the effects on qualitative atheroma content, termed plaque stabilising effects.40,41 Reversing atherosclerosis and stabilising vulnerable plaques may, in part, be responsible for the effects of intensive statin therapy on MACE. In addition to the reduction in MACE, there was a substantial reduction in admissions to hospital for heart failure with intensive statin therapy. Potential mechanisms include favourable ventricular remodelling,42–45 decreased infarct size owing to reduced ischaemia-reperfusion injury45–48 and reduced CRP-mediated complement activation.49 The effect of reducing CRP in acute myocardial infarction was demonstrated in a recent study where the therapeutic inhibition of CRP decreased infarct size in a rat model.50 The use of statins for heart failure is currently being evaluated in the CORONA and GISSI-HF trials. There was no difference in ischaemic events measured by ambulatory electrocardiography in VASCULAR BASIS, nor was there any difference in flow-mediated vasodilatation, exercise duration, and angina frequency. These end points were not assessed by other trials, and authors acknowledged that their study may have been underpowered to detect significant associations. Continuing trials include SEARCH, HPS II, and IMPROVE-IT. The last of these is scheduled to randomise 10 000 patients with recent ACS to simvastatin 40 mg/day plus ezetimibe 10 mg/day or simvastatin 40 mg/day alone. The median projected LDL-C of 1.3 mmol/l (50 mg/dl) in the combination therapy group will test the hypothesis that lower LDL-C is better. Several potential limitations of our meta-analysis should be noted. First, five out of six RCTs evaluated intensive atorvastatin therapy, with one evaluating simvastatin and none evaluating rosuvastatin. Thus, the external validity and generalisability to other statins is limited and we cannot comment on agent-specific effects for the efficacy or safety outcome measures. Second, some RCTs classified revascularisation and resuscitated cardiac arrest as MACE, which might have altered the estimated effect of any given treatment. We believe that this risk is minimal because our results for the end point MACE were consistent with the results for the end point of death or reinfarction. Finally, most RCTs did not report measurements of left ventricular function after statin therapy, which might have helped explain the effects on heart failure. However, we did use the end point of admission to hospital for heart failure to ensure an objective measurement. In conclusion, our meta-analysis suggests that intensive statin therapy is beneficial in patients with CHD and particularly in patients with recent ACS, where there is a 25% reduction in the odds of all-cause mortality. We found that intensive statin therapy is safe, since the absolute rates of adverse hepatic events and adverse muscular events are low (1.4% and 0.1%, respectively). Previous studies found that intensive statin therapy is cost effective after ACS,56–60 although a comprehensive analysis of cost effectiveness must be conducted. Based on our findings, the indication for intensive statin therapy is a key determinant of the potential mortality benefit to be derived. We conclude that intensive statin therapy should be recommended after recent ACS and considered on a case by case basis in stable CHD. Baigent C, Keech A, Kearney PM, et al. Efficacy and safety of cholesterol-lowering treatment: prospective meta-analysis of data from 90,056 participants in 14 randomised trials of statins. Lancet2005;366:1267–78. O’Keefe JH Jr, Cordain L, Harris WH, et al. Optimal low-density lipoprotein is 50 to 70 mg/dl: lower is better and physiologically normal. J Am Coll Cardiol2004;43:2142–6. Ray KK, Cannon CP. Intensive statin therapy in acute coronary syndromes: clinical benefits and vascular biology. Curr Opin Lipidol2004;15:637–43. Takemoto M, Liao JK. Pleiotropic effects of 3-hydroxy-3-methylglutaryl coenzyme a reductase inhibitors. Arterioscler Thromb Vasc Biol2001;21:1712–19. Kinlay S, Schwartz GG, Olsson AG, et al. High-dose atorvastatin enhances theline in inflammatory markers in patients with acute coronary syndromes in the MIRACL study. Circulation2003;108:1560–6. Schwartz GG, Olsson AG, Ezekowitz MD, et al. Effects of atorvastatin on early recurrent ischemic events in acute coronary syndromes: the MIRACL study: a randomized controlled trial. JAMA2001;285:1711–18. Cannon CP, Steinberg BA, Murphy SA, et al. Meta-analysis of cardiovascular outcomes trials comparing intensive versus moderate statin therapy. J Am Coll Cardiol2006;48:438–45. Moher D, Cook DJ, Eastwood S, et al. Improving the quality of reports of meta-analyses of randomised controlled trials: the QUOROM statement. Quality of Reporting of Meta-analyses. Lancet1999;354:1896–900. Grundy SM, Cleeman JI, Merz CN, et al. Implications of recent clinical trials for the National Cholesterol Education Program Adult Treatment Panel III Guidelines. J Am Coll Cardiol2004;44:720–32. de Lemos JA, Blazing MA, Wiviott SD, et al. Early intensive vs a delayed conservative simvastatin strategy in patients with acute coronary syndromes: phase Z of the A to Z trial. JAMA2004;292:1307–16. Cannon CP, Braunwald E, McCabe CH, et al. Intensive versus moderate lipid lowering with statins after acute coronary syndromes. N Engl J Med2004;350:1495–504. Pedersen TR, Faergeman O, Kastelein JJ, et al. High-dose atorvastatin vs usual-dose simvastatin for secondary prevention after myocardial infarction: the IDEAL study: a randomized controlled trial. JAMA2005;294:2437–45. LaRosa JC, Grundy SM, Waters DD, et al. Intensive lipid lowering with atorvastatin in patients with stable coronary disease. N Engl J Med2005;352:1425–35. Stone PH, Lloyd-Jones DM, Kinlay S, et al. Effect of intensive lipid lowering, with or without antioxidant vitamins, compared with moderate lipid lowering on myocardial ischemia in patients with stable coronary artery disease: the Vascular Basis for the Treatment of Myocardial Ischemia Study. Circulation2005;111:1747–55. Nissen SE, Tuzcu EM, Schoenhagen P, et al. Effect of intensive compared with moderate lipid-lowering therapy on progression of coronary atherosclerosis: a randomized controlled trial. JAMA2004;291:1071–80. Ray KK, Cannon CP. Early time to benefit with intensive statin treatment: could it be the pleiotropic effects? Am J Cardiol2005;96:54–60F. Bourcier T, Libby P. HMG CoA reductase inhibitors reduce plasminogen activator inhibitor-1 expression by human vascular smooth muscle and endothelial cells. Arterioscler Thromb Vasc Biol2000;20:556–62. Landmesser U, Bahlmann F, Mueller M, et al. Simvastatin versus ezetimibe: pleiotropic and lipid-lowering effects on endothelial function in humans. Circulation2005;111:2356–63. James SK, Armstrong P, Barnathan E, et al. Troponin and C-reactive protein have different relations to subsequent mortality and myocardial infarction after acute coronary syndrome: a GUSTO-IV substudy. J Am Coll Cardiol2003;41:916–24. Yip HK, Wu CJ, Chang HW, et al. Levels and values of serum high-sensitivity C-reactive protein within 6 hours after the onset of acute myocardial infarction. Chest2004;126:1417–22. Foussas SG, Zairis MN, Lyras AG, et al. Early prognostic usefulness of C-reactive protein added to the Thrombolysis In Myocardial Infarction risk score in acute coronary syndromes. Am J Cardiol2005;96:533–7. Morrow DA, Rifai N, Antman EM, et al. C-reactive protein is a potent predictor of mortality independently of and in combination with troponin T in acute coronary syndromes: a TIMI 11A substudy. Thrombolysis in Myocardial Infarction. J Am Coll Cardiol1998;31:1460–5. Thavendiranathan P, Bagai A, Brookhart MA, et al. Primary prevention of cardiovascular diseases with statin therapy: a meta-analysis of randomized controlled trials. Arch Intern Med2006;166:2307–13. Kinlay S, Timms T, Clark M, et al. Comparison of effect of intensive lipid lowering with atorvastatin to less intensive lowering with lovastatin on C-reactive protein in patients with stable angina pectoris and inducible myocardial ischemia. Am J Cardiol2002;89:1205–7. Ridker PM, Morrow DA, Rose LM, et al. Relative efficacy of atorvastatin 80 mg and pravastatin 40 mg in achieving the dual goals of low-density lipoprotein cholesterol <70 mg/dl and C-reactive protein <2 mg/l: an analysis of the PROVE-IT TIMI-22 trial. J Am Coll Cardiol2005;45:1644–8. Ray KK, Cannon CP, McCabe CH, et al. Early and late benefits of high-dose atorvastatin in patients with acute coronary syndromes: results from the PROVE IT-TIMI 22 trial. J Am Coll Cardiol2005;46:1405–10. Muhlestein JB, Anderson JL, Horne BD, et al. Early effects of statins in patients with coronary artery disease and high C-reactive protein. Am J Cardiol2004;94:1107–12. Wiviott SD, de Lemos JA, Cannon CP, et al. A tale of two trials: a comparison of the post-acute coronary syndrome lipid-lowering trials A to Z and PROVE IT-TIMI 22. Circulation2006;113:1406–14. Ridker PM, Cannon CP, Morrow D, et al. C-reactive protein levels and outcomes after statin therapy. N Engl J Med2005;352:20–8. Nissen SE, Tuzcu EM, Schoenhagen P, et al. Statin therapy, LDL cholesterol, C-reactive protein, and coronary artery disease. N Engl J Med2005;352:29–38. Wiviott SD, Cannon CP, Morrow DA, et al. Can low-density lipoprotein be too low? The safety and efficacy of achieving very low low-density lipoprotein with intensive statin therapy: a PROVE IT-TIMI 22 substudy, J Am Coll Cardiol2005;46:1411–16. O’Keefe JH Jr, Cordain L. Cardiovascular disease resulting from a diet and lifestyle at odds with our Paleolithic genome: how to become a 21st-century hunter-gatherer. Mayo Clin Proc2004;79:101–8. Cordain L, Eaton SB, Miller JB, et al. The paradoxical nature of hunter-gatherer diets: meat-based, yet non-atherogenic. Eur J Clin Nutr. 2002;56 (Suppl 1) :S42–52. Glueck CJ, Kelley W, Gupta A, et al. Prospective 10-year evaluation of hypobetalipoproteinemia in a cohort of 772 firefighters and cross-sectional evaluation of hypocholesterolemia in 1,479 men in the National Health and Nutrition Examination Survey I. Metabolism1997;46:625–33. Malloy MJ, Kane JP. Disorders involving deficiencies of lipoproteins that contain B apolipoproteins. In: Betteridge DJ, Illingworth DR, Shepherd J, eds. Lipoproteins in health and disease. New York: Oxford University Press, 1999:863–77. Okazaki S, Yokoyama T, Miyauchi K, et al. Early statin treatment in patients with acute coronary syndrome: demonstration of the beneficial effect on atherosclerotic lesions by serial volumetric intravascular ultrasound analysis during half a year after coronary event: the ESTABLISH Study. Circulation2004;110:1061–8. Nissen SE, Nicholls SJ, Sipahi I, et al. Effect of very high-intensity statin therapy on regression of coronary atherosclerosis: the ASTEROID trial. JAMA2006;295:1556–65. Taylor AJ, Kent SM, Flaherty PJ, et al. ARBITER: Arterial Biology for the Investigation of the Treatment Effects of Reducing Cholesterol: a randomized trial comparing the effects of atorvastatin and pravastatin on carotid intima medial thickness. Circulation2002;106:2055–60. Smilde TJ, van WS, Wollersheim H, et al. Effect of aggressive versus conventional lipid lowering on atherosclerosis progression in familial hypercholesterolaemia (ASAP): a prospective, randomised, double-blind trial. Lancet2001;357:577–81. Libby P, Aikawa M. Stabilization of atherosclerotic plaques: new mechanisms and clinical targets. Nat Med2002;8:1257–62. Libby P, Aikawa M. Mechanisms of plaque stabilization with statins. Am J Cardiol2003;91:4–8B. Bauersachs J, Galuppo P, Fraccarollo D, et al. Improvement of left ventricular remodeling and function by hydroxymethylglutaryl coenzyme a reductase inhibition with cerivastatin in rats with heart failure after myocardial infarction. Circulation2001;104:982–5. Hayashidani S, Tsutsui H, Shiomi T, et al. Fluvastatin, a 3-hydroxy-3-methylglutaryl coenzyme a reductase inhibitor, attenuates left ventricular remodeling and failure after experimental myocardial infarction. Circulation2002;105:868–73. Nahrendorf M, Hu K, Hiller KH, et al. Impact of hydroxymethylglutaryl coenzyme a reductase inhibition on left ventricular remodeling after myocardial infarction: an experimental serial cardiac magnetic resonance imaging study. J Am Coll Cardiol2002;40:1695–700. Landmesser U, Engberding N, Bahlmann FH, et al. Statin-induced improvement of endothelial progenitor cell mobilization, myocardial neovascularization, left ventricular function, and survival after experimental myocardial infarction requires endothelial nitric oxide synthase. Circulation2004;110:1933–9. Ueda Y, Kitakaze M, Komamura K, et al. Pravastatin restored the infarct size-limiting effect of ischemic preconditioning blunted by hypercholesterolemia in the rabbit model of myocardial infarction. J Am Coll Cardiol1999;34:2120–5. Bell RM, Yellon DM. Atorvastatin, administered at the onset of reperfusion, and independent of lipid lowering, protects the myocardium by up-regulating a pro-survival pathway. J Am Coll Cardiol2003;41:508–15. Yamakuchi M, Greer JJ, Cameron SJ, et al. HMG-CoA reductase inhibitors inhibit endothelial exocytosis andrease myocardial infarct size. Circ Res2005;96:1185–92. Griselli M, Herbert J, Hutchinson WL, et al. C-reactive protein and complement are important mediators of tissue damage in acute myocardial infarction. J Exp Med1999;190:1733–40. Pepys MB, Hirschfield GM, Tennent GA, et al. Targeting C-reactive protein for the treatment of cardiovascular disease. Nature2006;440:1217–21. Ray KK, Bach R, Cannon CP, et al. Validating the new NCEP III LDL target of <70 mg/dl among elderly patients: an analysis from PROVE-IT TIMI 22. J Am Coll Cardiol2005;45 (Suppl 1) :412A. Wenger NK, Lewis SJ, Herrington DM, 1–2–2005. Effect of 80 mg versus 10 mg of atorvastatin in patients > and <65 years of age with stable coronary heart disease. Circulation2005;112 (Suppl 17) :II662. LaRosa JC. Is aggressive lipid-lowering effective and safe in the older adult? Clin Cardiol2005;28:404–7. Deedwania PC. Effect of aggressive versus moderate lipid-lowering therapy on myocardial ischemia: the rationale, design, and baseline characteristics of the Study Assessing Goals in the Elderly (SAGE). Am Heart J2004;148:1053–9. Deedwania P. Effects of intensive versus moderate lipid-lowering therapy on myocardial ischemia in older patients with coronary heart disease: results of the study assessing goals in the elderly (SAGE). J Am Coll Cardiol2005;45 (Suppl. 1) :203–4A. Buller N, Gillen D, Casciano R, et al. A pharmacoeconomic evaluation of the Myocardial Ischaemia Reduction with Aggressive Cholesterol Lowering (MIRACL) study in the United Kingdom. Pharmacoeconomics2003;21 (Suppl 1) :25–32. Olsson A, Casciano R, Stern L, et al. A pharmacoeconomic evaluation of aggressive cholesterol lowering in Sweden. Int J Cardiol2004;96:51–7. Casciano R, Tarride JE, Breton MC, et al. A pharmacoeconomic evaluation of the myocardial ischemia reduction with aggressive cholesterol lowering (MIRACL) study in Canada. Can J Clin Pharmacol2004;11:e179–90. Lange AP, Szucs TD. [Cost-effectiveness of atorvastatin in the early treatment of acute coronary syndromes in Germany based on the MIRACL study.] Med Klin (Munich)2004;99:500–5. Gomez-Gerique JA, Casciano R, Stern L, et al. A pharmacoeconomic evaluation of the effects of atorvastatin on early recurrent ischemic events in acute coronary syndromes in Spain. Eur J Health Econ2004;5:278–84. J Afilalo participated in the conception and design of the meta-analysis, data acquisition, data analysis and interpretation, drafting of the manuscript, critical review of the manuscript for intellectual content, and statistical analysis. AA Majdan participated in conception and design of the meta-analysis, data acquisition, drafting of the manuscript, and critical review of the manuscript for intellectual content. MJ Eisenberg participated in conception and design of the meta-analysis, data analysis and interpretation, critical review of the manuscript for intellectual content, and administrative support and supervision.Dr Eisenberg is a senior physician scientist of the Quebec Foundation for Health Research. Manuscript presented in abstract form at the World Congress of Cardiology, 6 September 2006. Conflicts of interest: The authors of this meta-analysis have no personal or financial conflicts of interest to report. All authors had full access to all the data and had final responsibility for the decision to submit for publication. Heart 2007; 93 1230-1230 Published Online First: 21 Sep 2007.